I had the opportunity to interview a Freshman student, Nick Boone (@2050TGOD) that I coincidentally met on Twitter. He saw a conversation that I was having with a popular YouTube personality, and gave his opinion on iPads in the classroom. I took this chance to contact him and ask if he would answer a few questions. He almost immediately agreed to the interview, which we completed via Google Docs just a matter of a couple hours. Nick had the opportunity to participate in a 1:1 iPad program at his high school in San Diego. Thanks Nick for agreeing to this interview! What are you currently studying? 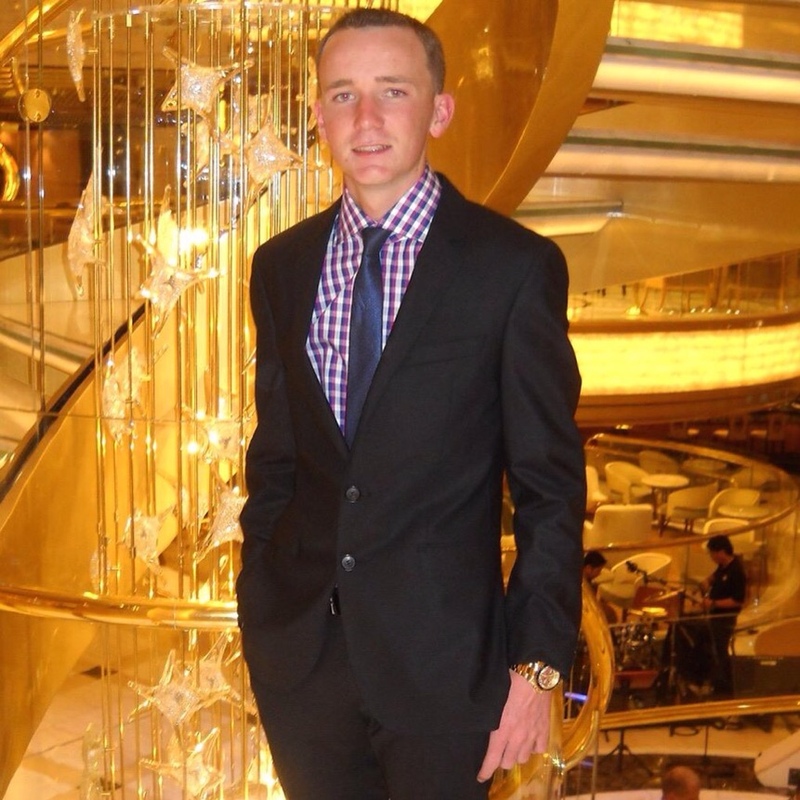 I am currently a freshman at the University of Arizona, majoring in Business Management/ Entrepreneurship. When were iPads introduced as a 1:1 program in your school? iPads were introduced to me in my sophomore year of high school, in 2011. Did the school provide the iPads or were students expected to purchase one on their own? Which model iPad did (do) you use? I used the iPad 2 16gb Wifi configuration, that's the only model that was offered. Which apps did you use most regularly? The apps I used most regularly were Dropbox, Google Chrome, Notability, and HMH Fuse. I can't remember all of them but those were some that I used on a daily basis. My textbooks for classes were all apps/iBooks as well. Did your teachers completely abandon textbooks? Which subjects continued to use textbooks? Some yes, some no. My English classes were really the only classes to still heavily use textbooks. iPad integration was attempted but did not work out very well. My other classes such as math, chemistry/anatomy/oceanography, religious studies, and US/World history all bonded textbooks, iPads were at the centre of coursework. What is the greatest drawback of using iPads instead of conventional textbooks? The greatest drawback was simply distraction. I would have loved to continue using textbooks and eliminate the iPads. This sounds weird, since everything revolves around technology today, but in the classroom I really didn't see a huge impact of iPads. With WiFi at your fingertips on a device allowed by the school, paying attention in class was challenging. Students were always playing games or checking Facebook. With textbooks, you had no choice but to pay attention and follow along, with iPads it was your choice, you really had to be disciplined and not be tempted by the endless possibilities of having an iPad in hand. Having an iPad in the classroom requires great responsibility. What things did you like about the iPad program? The iPad made me more responsible as a student. I realized I had two options. I could either play games all class and tune out the teacher, or actually pay attention and take notes. In some classes it was a hard decision I mean lets face it, not all subjects interest us. Knowing I had to get good grades and really focus on my studies, I turned off the games and focused on the subject being taught. I loved the great responsibilities the iPads brought. What could be done in future implementations? Definitely more restrictions on the device. Profiles were installed on the iPads so the school basically controlled the iPad. They could ban apps from being downloaded, and shut down certain apps if you weren't using the iPads correctly. For example, if an app became increasingly popular, such as snapchat, they would send out an email that basically told us if we used snapchat on campus they would shut down safari on our iPads until we deleted the app. Although that was an effective approach, I don't believe they should continue using that method. In the future, I believe they should completely disable the ability to download apps. With the aforementioned profiles, the school could download apps and have them directly sent to either all student iPads, or iPads registered to specific students in specific classes. That is the only way they should allow apps to be downloaded on iPads. Social media apps, and games should not be allowed on a device that is implemented to enhance learning, that is where the problem lies. Although technology can greatly enhance learning in the education system, it can also serve as a huge setback at the same time if not implemented properly. Allowing students to download games and social media apps on the same device that they're supposed to be doing homework and taking notes on is a huge mistake. Everyone has iPhones nowadays or a smart phone of some sort, with tons of games and social media apps. That's where they can play all their games and post to Facebook. Leave the iPads for school work and school work only. What is some advice you would give a teacher starting a 1:1 iPad program? Really familiarize yourself with the iPads and the apps you plan to be using. A lot of times in class my teachers didn't know how to properly do something, resulting in the tech teams always being called in. That took up class time and was a big distraction. Another piece of advice is take great consideration in purchasing AppleTV. Although iPads can be displayed on a projector, it's not the most efficient way. Often times my teachers struggled with connections and cables, resulting in alteration of class activities. Ultimately, AppleTV will allow greater teacher mobility. Familiarizing yourself with current technology will be crucial to your success with iPads in the classroom. After three years of iPads in classes, what did you appreciate the most? Earlier in the post, I mentioned the iPads bringing responsibility to students. I'm very appreciative of that, and I can't stress it enough. I also appreciated the variety iPads brought. With endless amounts of apps and creativity, my teachers were able to find new ways of doing projects and group tasks. Group projects went from being something everyone resented hearing, to something everyone loved because we were able to make our own movies and podcasts, or create a children's book on any given subject, all of which was available to us at our fingertips in the classroom. What did you regret, if anything? I always try to stray away from brining typical cliché sayings into interviews, but with the iPads I truly had no regrets. Although they served as a great distraction to learning, I was able to move past those distractions and really focus on school work. 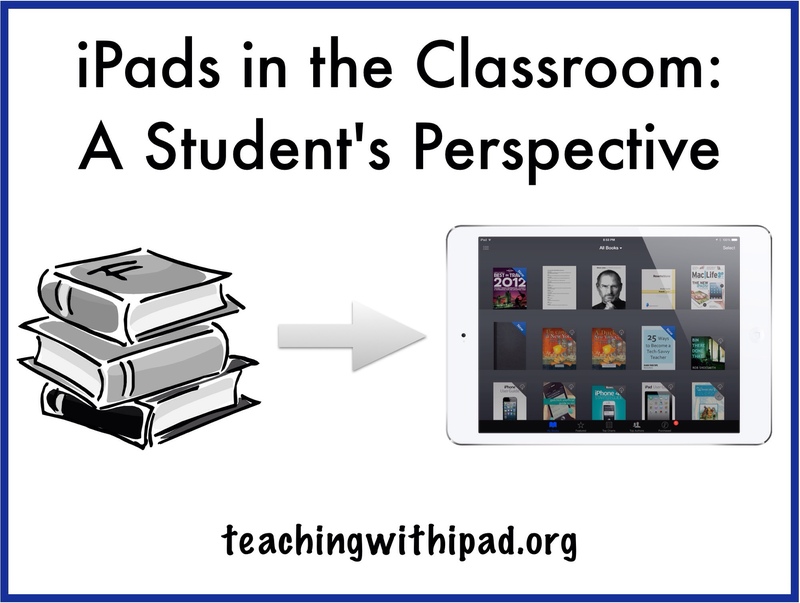 I was able to understand and accept all the positives iPads brought to the classroom, and forget the negatives. I made the most out of having iPads instead of books, and I thoroughly enjoyed using them, as it brought a whole new perspective on learning. Were the majority of teachers well-trained in teaching with iPads? Were they good at helping with troubleshooting? Or were students expected to solve their own tech-related issues? I touched on this topic a little bit earlier in the post but ultimately the answer is no. It was something they'd never seen before and we were all greenhorns in regards to using them in the classroom. We had a tremendous tech team at my school so issues were able to be resolved but not in a timely manner. As students we weren't expected to solve our own issues, but if an issue did arise we just googled it or searched for an instructional video on YouTube. Are you using an iPad now, while in college/university? I primarily use a laptop, as I do not believe an iPad would be able to handle the amount of coursework I am faced with. I do have my own iPad mini 2 though, I use it mostly for personal use but I always bring it to class. Taking notes on my iPad is far more convenient than pulling out my laptop. I use my iPad for little things in class, if we need to pull up a video or surf the web it works perfectly. As far as completing assignments goes, not so much. Thank you very much, Nick, for giving us your insight from a student's perspective! Thank you for having me, Steve. I loved discussing these questions. If at all possible, never buy a 16GB device. Pay the extra $100 for the bump up to 64GB. A textbook can be as much as 2-3 GB if it is graphic intensive. Students will never be able to have more than 3-4 textbooks on their iPads, let alone have any proper space to create anything else. Restrictions need to be properly set up and discussed. If your students are impressionable and not the most responsible, there needs to be a proper implementation of rules and restrictions set up. Teachers must try their best to eliminate anything that hinders learning, both during class and outside of it. Having gone to university myself before the days of WiFi (I'm aging myself, I know), I didn't experience the temptations of having the entire Internet in front of me during lectures. WiFi is readily available almost anywhere you go now. Is this a common problem for students both in high school and in university? Students need to be strong willed not to be distracted by everything on an iPad. “Leave the iPads for school work and school work only.” – I like this quote, but is it feasible for a 1:1 program? Has the allure of iPads fallen enough so that students can focus on learning and creating great projects? Or will they continue to be distracted by the million and one things that one can consume and do on the device? There you have it. Interesting and well thought-out comments from a mature student, no more than 20 years old. It boils down, once again, to proper professional development of the educators teaching with iPads. Like almost all subjects, if a teacher is not passionate about what they are teaching (technology, in this case), their teaching will reflect this. Thoughts? Comments? Please let us know! Thanks for reading! I would love to hear especially from teachers already doing a 1:1 program. Thanks Jeanne! Appreciate the comment! Apple is making significant changes to iPad deployment for education requirements in the coming year. This is a good move by the company to sell more iPads, but they need to draft a certain strategy to monitor the student’s iPad along with sharing the detailed activity of the students with their parents and teachers. Thanks Aaron for the contribution!